The Maserati Silver Cup Final took place yesterday and saw Lechuza Caracas Polo Team winning over Las Dos Lunas A&G Private Bank by 10 to 8. 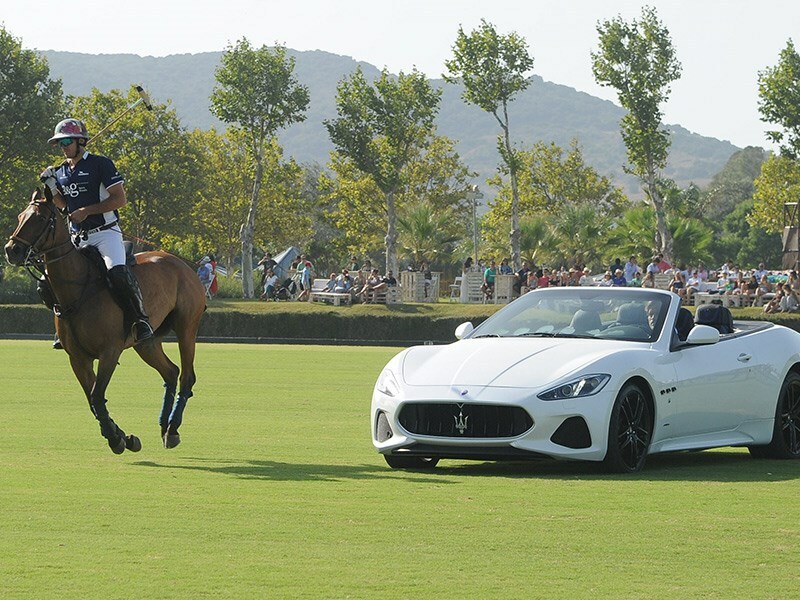 The Maserati Silver Cup is the second of three high handicap trophies to be awarded during the 46th International Polo Tournament in Sotogrande, held at the iconic Santa Maria Polo Club, of which Maserati is the Official Car. Venezuelan businessman and Lechuza Caracas patron Victor Vargas was awarded the best player trophy, while Marquita was named the best pony. In Sotogrande, Maserati has a strong presence within the various facilities of the Santa Maria Polo Club, with a lounge, four VIP terraces and a Maserati Store. Visitors of the Santa Maria Polo Club can also book a test drive: from the Ghibli executive saloon, to the Quattroporte flagship, as well as the first Maserati SUV, the Levante, are all available to be test driven with Maserati’s team of professional drivers. Maserati has unveiled the GranCabrio Sport MY18 exclusively at the Santa Maria Polo Club in Sotogrande. The stylish convertible with its restyled exterior in 16 colours and 13 interior colours, is available in leather or Alcantara and makes its debut in Spain. It is considered the ultimate expression of Maserati’s passion, sportiness and craftsmanship and remains unique in the supercar segment thanks to its timeless design and comfortable 4-seat interior. Maserati’s presence in Sotogrande doesn’t end here: the Maserati Store, located in the main pavilion and open daily from 17:00 to 23:00 until August 27, offers a selection of accessories, clothes and memorabilia of the iconic Italian car manufacturer. Spanish top model Nieves Alvarez arrived at the Santa Maria Polo Club in a Maserati Ghibli. Looking stunning in a white dress by Temperley London, wearing Bulgari jewels and accessories, and Aquazzura pumps, she said after the game: "I'm delighted to be here in Sotogrande again: I love horses and polo. It is a real privilege to hand over the Maserati Silver Cup to Victor Vargas and his team Lechuza Caracas after such a high octane match. Maserati and Polo share the same values: dedication, passion, performance and a quest for perfection, it’s a match made in heaven." Other than Nieves Alvarez, a host of celebrities watched the high octane match from the Maserati VIP terrace, including Scott Schuman, aka The Sartorialist, Harpers Bazaar Spain Editor in Chief Yolanda Sacristan, with her husband, former basketball player of the Spanish National Team Jose Miguel Antunez and Vicente Dalmau Cebrian, Earl of Creixel. As part of the limited edition range for the Maserati Polo Tour 2017, La Martina has designed four exclusive polo shirts: each celebrating a different aspect of the partnership with Maserati.Of the four locations in the Maserati Polo Tour, Sotogrande represents the most iconic summer Polo event, this is why a white and airy piquet fabric was chosen for this specific design. The Sotogrande polo has a Vanisé knitted collar with a shiny under collar, personalised buttons, lurex embroideries and Alcantara applications on the sleeve. The back of the shirt features a geometric print inspired by the map of Spain and emphasises the connection to the Iberian Peninsula. You can stay updated on all of Maserati Polo Tour events through the website: www.maseratipolo.com, where you can access photos and extra content.